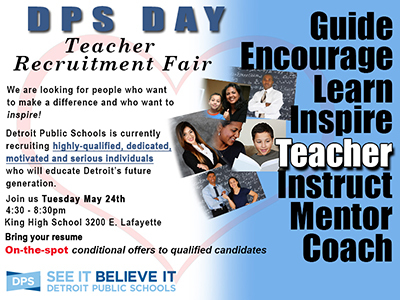 To help recruit talented educators across all grade levels and content areas to positions for the coming school year, Detroit Public Schools will host “DPS Day,” a Teacher Recruitment Fair, on Tuesday, May 24 at Martin Luther King, Jr. Senior High School. During this unique recruiting opportunity, job candidates will have the opportunity to participate in on-site interviews, and the District will also make conditional offers to qualified candidates. The teaching positions being recruited during the teacher fair will also build upon the district’s current talent acquisition pool. Applications are being accepted for all teaching areas. However, there is a critical need in Early Childhood Education, Special Education, Mathematics, Secondary Science and World Language. As a result of retirements, separations and new program offerings, DPS anticipates 250-350 teacher openings for the upcoming 2016-2017 school year. Interested candidates, please bring your resume and transcripts. Applicants can call 313-873-6897 or 313-240-4377 or visit detroitk12.org/employmentfor more details.